Al Hartmann | The Salt Lake Tribune A record-high 360 men and women inmates line up for their high school graduation procession at the Draper prison in June 2013 to celebrate an important milestone on their paths toward returning to the community as law-abiding citizens. 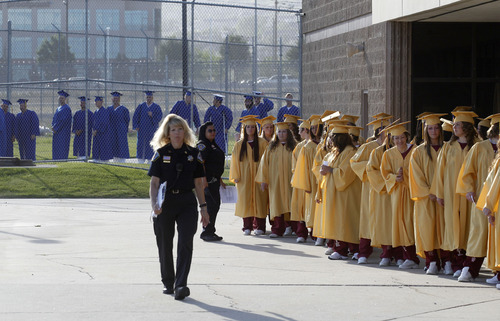 Al Hartmann | The Salt Lake Tribune A record-high 360 men and women inmates line up for their high school graduation procession at the Draper prison Wednesday June 12 to celebrate an important milestone on their paths toward returning to the community as law-abiding citizens. Another 140 inmates will likewise walk in a commencement ceremony at the Central Utah Correctional Facility in Gunnison on June 19. 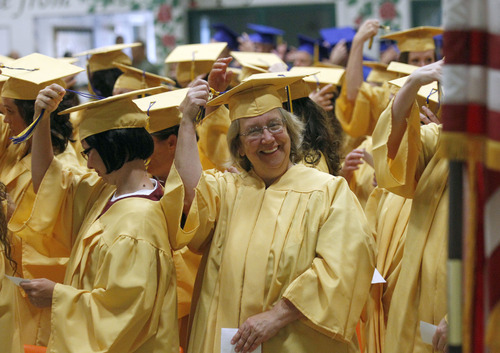 Al Hartmann | The Salt Lake Tribune Women inmates move tassles on their mortarboards upon receiving their high school diplomas at the Utah State Prison in Draper Wednesday June 11. A record-high 360 men and women inmates graduated with high school diplomas and celebrated an important milestone on their paths toward returning to the community as law-abiding citizens. Another 140 inmates will likewise walk in a commencement ceremony at the Central Utah Correctional Facility in Gunnison on June 19. 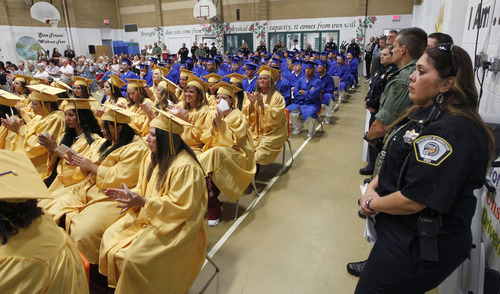 Al Hartmann | The Salt Lake Tribune A record-high 360 men and women inmates line up for high school graduation procession at the Draper prison Wednesday June 12 to celebrate an important milestone on their paths toward returning to the community as law-abiding citizens. Another 140 inmates will likewise walk in a commencement ceremony at the Central Utah Correctional Facility in Gunnison on June 19. Al Hartmann | The Salt Lake Tribune A record-high 360 men and women inmates fill the auditorium for their high school graduation ceremony at the Draper prison Wednesday June 12 to celebrate an important milestone on their paths toward returning to the community as law-abiding citizens. Another 140 inmates will likewise walk in a commencement ceremony at the Central Utah Correctional Facility in Gunnison on June 19. Al Hartmann | The Salt Lake Tribune A record-high 360 men and women inmates fill the auditorium for their high school graduation ceremony at the Draper prison Wednesday June 12 to celebrate an important milestone on their paths toward returning to the community as law-abiding citizens. Another 140 inmates will likewise walk in a commencement ceremony at the Central Utah Correctional Facility in Gunnison on June 19. 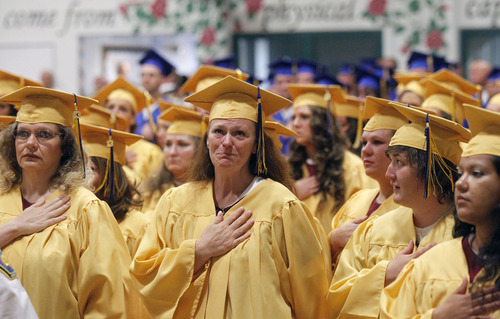 Al Hartmann | The Salt Lake Tribune Women inmates applaud as men come forward to recieve their high school diplomas at the Utah State Prison in Draper Wednesday June 11. A record-high 360 men and women inmates graduated with high school diplomas and celebrated an important milestone on their paths toward returning to the community as law-abiding citizens. Another 140 inmates will likewise walk in a commencement ceremony at the Central Utah Correctional Facility in Gunnison on June 19. 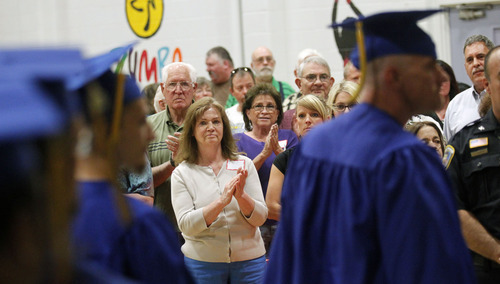 Al Hartmann | The Salt Lake Tribune Friends and family applaud as inmates leave the auditorium with their high school diplomas at the Utah State Prison in Draper Wednesday June 11. 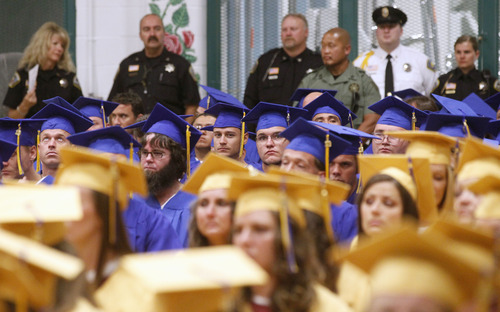 A record-high 360 men and women inmates graduated with high school diplomas and celebrated an important milestone on their paths toward returning to the community as law-abiding citizens. Another 140 inmates will likewise walk in a commencement ceremony at the Central Utah Correctional Facility in Gunnison on June 19. Al Hartmann | The Salt Lake Tribune Women inmates hold their hand to their hearts during the flag ceremony at the Utah State Prison in Draper Wednesday June 11. A record-high 360 men and women inmates graduated with high school diplomas and celebrated an important milestone on their paths toward returning to the community as law-abiding citizens. Another 140 inmates will likewise walk in a commencement ceremony at the Central Utah Correctional Facility in Gunnison on June 19. 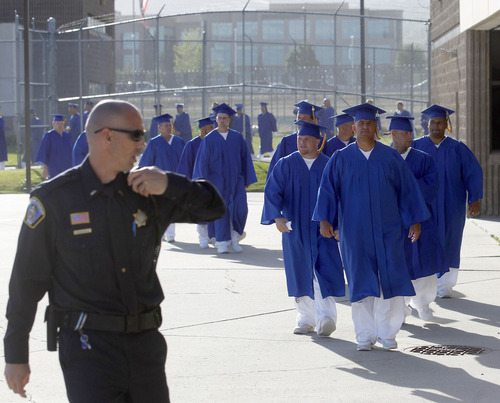 Al Hartmann | The Salt Lake Tribune A record-high 360 men and women inmates line up for their high school graduation procession at the Draper prison Wednesday June 12 to celebrate an important milestone on their paths toward returning to the community as law-abiding citizens. Another 140 inmates will likewise walk in a commencement ceremony at the Central Utah Correctional Facility in Gunnison on June 19. Al Hartmann | The Salt Lake Tribune Women inmates receive congratulations and their high school diploma at the Utah State Prison in Draper Wednesday June 11. A record-high 360 men and women inmates graduated with high school diplomas and celebrated an important milestone on their paths toward returning to the community as law-abiding citizens. Another 140 inmates will likewise walk in a commencement ceremony at the Central Utah Correctional Facility in Gunnison on June 19. Al Hartmann | The Salt Lake Tribune Inmates remove their gowns returning to their white prison clothing underneath after high school graduation at the Utah State Prison in Draper Wednesday June 11. A record-high 360 men and women inmates graduated with high school diplomas and celebrated an important milestone on their paths toward returning to the community as law-abiding citizens. Another 140 inmates will likewise walk in a commencement ceremony at the Central Utah Correctional Facility in Gunnison on June 19. A record-high number of state inmates  360 men and women  received high school diplomas Wednesday in a graduation ceremony at the Utah State Prison in Draper. Another 140 inmates at the Central Utah Correctional Facility in Gunnison will graduate from high school programs later this month. The Utah Department of Corrections coordinates with the Canyons School District in Draper and South Sanpete School District in Gunnison to provide high school equivalency programs. Various county jails that house state inmates also work with local school districts to provide such programs. Inmates who participate in educational programs while incarcerated are 20 percent less likely to re-offend, according to a 2012 analysis by the Utah Office of Legislative Research and General Counsel.